Retail Insights: Is the end of the Department Store near? According to Shopping Centers Today, in-line stores are outperforming department stores – a significant shift in how retail has traditionally functioned (“In-line stores are the new mall anchors at General Growth”, SCT, Nov. 2016). As of June 2016, anchor sales in the General Growth Properties (GGP is one of the largest mall owners and managers in the country) portfolio fell by 1.9%. On the flip side, between 2005 and 2015 non-anchor sales grew by 33%. This trend is being felt industry-wide – from 2005 to 2015 department store sales declined by 23%. Analysts suggest that millennials have something to do with it. They enjoy experiences more than things, and spend their money in restaurants, home furnishings, health and personal care. The good news is that downtown was made to offer an experience. The downtown environment is among the most conducive to offering millennials the mix of retail, services, entertainment, and perhaps most importantly the authenticity they crave. Nothing else comes close. Another potential impact is that as the anchor plays less of a role in driving in-line tenancy, traditional downtown’s without traditional department store anchors become much more appealing alternatives to retailers. 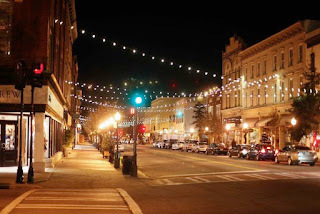 Consider a project I just wrote about recently, The Broughton Street Collection in Savannah, GA. The $100 million dollar project began as an assemblage by developer Ben Carter and now includes 37 properties and about 130,000 sf of retail space with nary a traditional anchor in site. Instead the mix includes a variety of national, regional and local retailers and restaurants – a lifestyle center if you will – but without the department store anchor. The key to this strategy is to ensure that the in-line retailers who are there are complimentary and share a similar customer base. Without an anchor, in-line retail must create its own synergy, the kind that will collectively attract visitors who seek a cohesive and complimentary set of offerings. I tend to suggest that downtown’s ask themselves this question – is there enough to do downtown to support a visit of an hour? or two or three? In-line retailers will care about the answer to this question because in many ways they need one another a lot of more than in situations where there is no anchor tenant. Downtown district’s that curate their retail mix might just be poised to give the regional mall a run for it’s money.